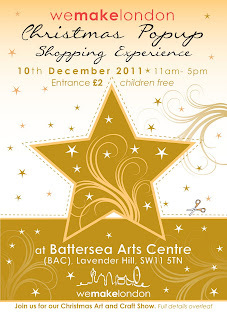 Still have some Christmas shopping to do or just fancy a fun and festive day out? pop along and say Hi at We Make London's Christmas Pop Up Shopping Experiance this Saturday 10th December at Battersea Arts Centre. It is always a great event and this year looks like the best yet. Do some screen printing, buy presents and even get them wrapped for free!! There is something for everyone. Take a look at the WeMake blog for more info.